Location : In the north India state of Uttar Pradesh, on the bank of the river Ganga. 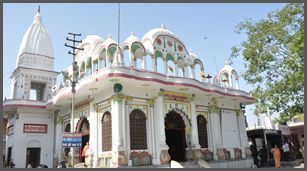 Major Tourist Attraction : Bathing Ghats, Kashi Vishwanath Temple, Bharat Mata Mandir, Gyanvapi Mosque, Durga Temple, New Vishwanath Temple, Alamgir Mosque, Central Institute of Higher Tibetan Studies, Bharat Kala Bhawan, Maharaja Banaras Vidya Mandir Museum, Museums & Arts Galleries, Banaras Hindu University, Tulsi Manas Temple. Best Buys : Benarasi Silk Sarees, Silk Brocades. Nearby Tourist Attraction : Kashi, Sarnath, Prayag, Kushinagar, Allahabad. 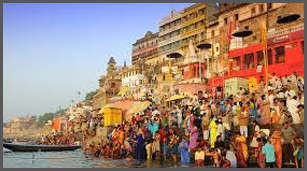 Varanasi, called Benaras by the English is one of the oldest living cities in the world. Mark Twain, the English author and literateur, who was amazed by the legend and sanctity of Benaras, once wrote : "Benaras is older than history, older than tradition, older even than legend and looks twice as old as all of them put together"
Situated in the north Indian state of Uttar Pradesh, Varanasi is also renowned for its rich tapestry of music, arts, crafts and education. Standing timelessly on the north bank of Ganga, Varanasi GhatVaranasi is located midway between Delhi and Kolkata. Known as the religious and cultural capital of India, Varanasi's known history dates back to about 3500 hundred years. However, Hindus believe that the city is eternal. Also been known as Kashi, Varanasi's present name is restoration of an ancient name meaning the city between two rivers - the Varuna and Asi. Established in 1950 as a university museum, Bharat Kala Bhawan is famous for its outstanding collection of miniature paintings. It has a rich collection of Rajasthani paintings, Pichhawai's, pahari painting, Nepalese & Tibetan Thankas, company paintings as well as paintings of contemporary artists, illustrated Mrigavati, Kalpa Sutra, Chora-Panchasika, Laura-Chanda, Shah-nama and some pages of Humza-nama are the rich possessions of this museum. The splendid 4 km stretch of the Ghats is an unique sight at Varanasi. The Ghats of Varanasi are best viewed at dawn, as a steady stream of devotees-swelling to thousands on auspicious days -perform rituals by the Ganga. The Ghats are best approached by Dashashwamedha ghat, where boats are available on hire. Also known as the Golden Temple, it is dedicated to Lord shiva, the presiding deity of the city. Varanasi is believed to be the point at which the first jyotirlinga, the fiery pillar of light by which shiva manifested has supremacy over others gods, broke through the Earth's crust and flared towards the heavens. More than the Ghats and even the Ganga, the Shivalinga installed in the temple remains the devotional focus of Varanasi. Varanasi offers a wide spectrum of accommodation facilities for the tourists coming from all over. There are luxury, deluxe, star and budget category hotels in Varanasi. Dharamshalas are also available here for the budget travelers. Just book the one which best suites your requirement. We offer the best accommodation with high quality facilities and services, something which you would expect.